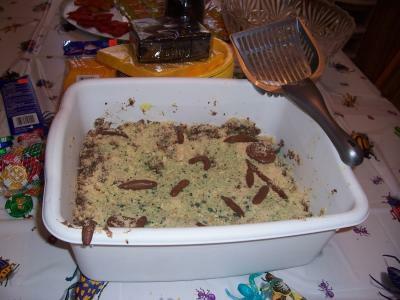 Writerly Ramblings: The Divine Kitty Litter Cake! The Divine Kitty Litter Cake! This recipe is worth repeating. As horrific as the picture looks, it's really a fun party cake in disguise! It's a great treat for your Halloween gathering. Everyone I know who has made one or eaten it absolutely loves it. Try it for yourself and have fun with it! 1. Prepare cake mixes and bake according to directions (any size pans). 3. Crumble sandwich cookies in small batches in food processor, scraping often. Set aside all but about 1/4 cup. To the 1/4 cup cookie crumbs, add a few drops green food coloring and mix until completely colored. 4. When cakes are cooled to room temperature, crumble into a large bowl. Toss with half the remaining cookie crumbs and the chilled pudding. Important: mix in just enough of the pudding to moisten it. You don't want it too soggy. Combine gently. 5. Line a new, clean kitty litter box. Put the cake/pudding/cookie mixture into the litter box. 6. Put 3 unwrapped Tootsie rolls in a microwave safe dish and heat until soft and pliable. Shape ends so they are no longer blunt, curving slightly. Repeat with 3 more Tootsie rolls bury them in the mixture. Sprinkle the other half of cookie crumbs over top. Scatter the green cookie crumbs lightly on top of everything -- this is supposed to look like the chlorophyll in kitty litter. 7. Heat 3 Tootsie Rolls in the microwave until almost melted. Scrape them on top of the cake; sprinkle with cookie crumbs. Spread remaining Tootsie Rolls over the top. For the fininshing touch take a couple Tootsie Rolls and heat until pliable, hang over the side of the kitty litter box, sprinkling it lightly with cookie crumbs. Place the box on a newspaper and sprinkle a few cookie crumbs around for a truly disgusting effect! 8. Notes: some people use half the amount of pudding…your choice. You can use any kind of cake mix since the topping will cover it.